Mohs surgery has come to be accepted as the single most effective technique for removing Basal Cell Carcinomas and Squamous Cell Carcinomas (BCCs and SCCs), the two most common skin cancers. This tissue sparing procedure has an unparalleled cure rate for BCC and SCC of 98 percent or higher. Mohs differs from other techniques in that microscopic examination of all excised tissues occurs during rather than after the surgery, thereby eliminating the need to “estimate” how far out or deep the roots of the skin cancer go. This allows the Mohs surgeon to remove all of the cancer cells while sparing as much normal tissue as possible. The procedure entails removing one thin layer of tissue at a time; as each layer is removed, its margins are studied under a microscope for the presence of cancer cells. If the margins are cancer-free, the surgery is ended. If not, more tissue is removed from the margin where the cancer cells were found, and the procedure is repeated until all the margins of the final tissue sample examined are clear of cancer. 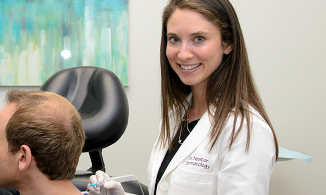 In this way, Mohs surgery eliminates the guesswork in skin cancer removal, producing the best therapeutic and cosmetic results. 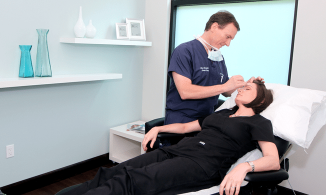 This treatment does not involve cutting of the skin but simply removal by scraping and burning the skin, therefore there are no stitches involved. 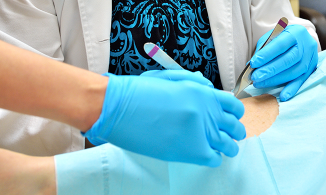 It is a simple 5-10 minute procedure very similar to a skin biopsy since you are anesthetized in the same exact way and the wound care is the same. There will be either a red, pink, purple or white circular scar usually three times as large as the biopsy. There is no a path report with this procedure however it has about a 90% cure rate and the area will be checked on every skin exam. An excision involves cutting out all the bad cells along with a margin of normal skin around them. This procedure is more time-consuming than a biopsy and takes about 20-30 minutes, but there is still no more pain than a biopsy as you are anesthetized in the same way. You will have stitches for about 1-3 weeks depending on location. After the sutures are removed, there will be a long thin scar 3-4 times the length of the biopsy with possible spots on either side where the stitched were removed. This scar can spread over time and become wider and thicker.